Harold DeLucia who, along with his brother Louis, runs NYC Trees which sells sustainable Christmas trees both online and at stands in Astoria, Long Island City and the Upper East Side. ASTORIA — It'll be a green Christmas — delivered right to your door. 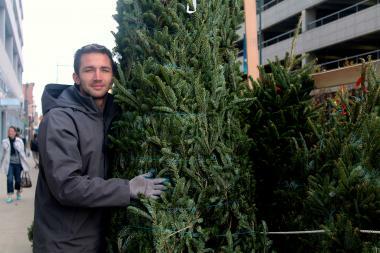 Two Astoria-born brothers who run farmers markets in the summer and supply produce to Queens eateries like Vesta Trattoria and M. Wells Dinette are getting into the holiday business this winter, selling regionally-sourced Christmas trees — complete with home delivery. Harold and Louis DeLucia run NYC Trees, which sells sustainable Christmas trees both online and at stands in Astoria, Long Island City and the Upper East Side. The DeLucia brothers are no stranger to farm sales. Their family runs a farm in New Jersey and, in the warmer months, the two brothers sell produce and fresh-cut flowers at several markets in Queens and on the Upper East Side. They also supply ingredients to several farm-to-table restaurants in the city. NYC Trees' products haven't been treated with pesticides, and are also sourced from small tree farms in New Jersey instead of being shipped from the Carolinas or Canada, where the trees from many holiday stalls typically hail. "It's high quality family farms, where they care about the trees. It's not a plantation," said elder brother Louis DeLucia, who says their trees come from farms around Princeton,where his family also runs their own produce farm. The trees are more eco-friendly because the shorter distance they travel means less fuel is used in transporting them, DeLucia said, and it also means they're fresher than trees that are trucked in from big plantations. "Plantations cut early because the snow comes early...the trees are all cut before Thanksgiving and put on tractor trailers," he said. "By the time you get it, it's already a month old. It's not as fragrant and doesn’t have that same look to it." NYC Trees are all cut the same week they're brought to the company's New York City stands, DeLucia said. "A tree like that will last you past Valentines Day. It's not going to drop any needles," he said. The Frasier Firs at NYC Trees, when purchased in-person from one of their stalls, start around $40 for a 3 to 4-footer, then $70 for a 5 to 6-foot tree, and up from there. But customers in Queens, Manhattan and Brooklyn who don't want to trek their tree home themselves can purchase it online and have it delivered — and even set up — by NYC Trees. DeLucia says they take care of everything, including the tree stand, and will even sweep up any tree-debris that might get left behind. The delivery and installation service starts at $79 for a 4-foot tree. The company also sells holiday wreaths and will be peddling its wares on weekends at the LIC Flea & Food's Holiday Market, which kicks off this Saturday. NYC Trees stands are open daily and are located in Astoria at the corner of 21st Street and 28th Avenue; in Long Island City, outside of the Food Cellar supermarket at 4-85 47th Rd. ; and on the Upper East Side outside Vespa restaurant at 1625 2nd Ave. Delivery and installation orders can be purchased at the company's website.